but a total change of mood sets in once your feet are through the door and into the palatial lobby, where the region’s warmth and glamour truly come into play. Found in the UAE’s capital, on the Abu Dhabi Corniche, the hotel boasts one of the city’s best beach clubs and the world’s highest suspended suite. 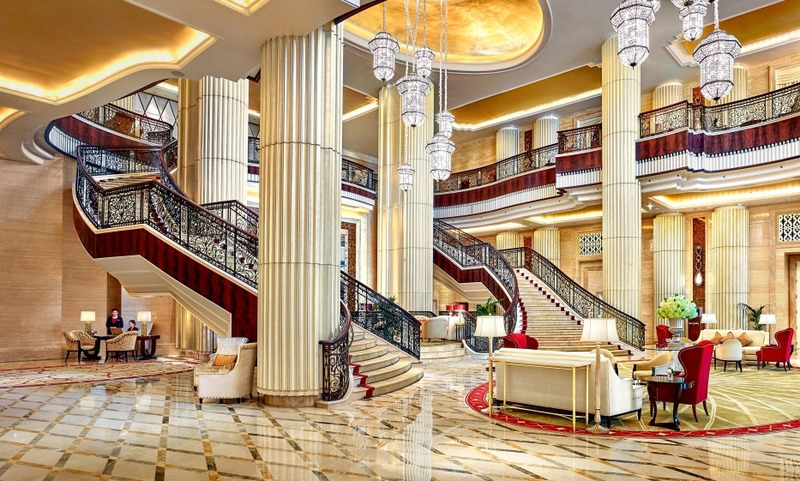 This St Regis resort is the destination of choice for those seeking to experience the dazzling opulence of the region – and every guest is treated to round-the-clock butler service. Spend a day or evening at Nation Riviera Beach Club with 3 restaurants, kids club, health club, private beach and pool with swim up bar. Enjoy complimentary St. Regis Butler Service for all room categories. Discover the exceptional Abu Dhabi suite - 1.400 sqm, highest hanging bridge suite in the world (200 m above ground). The St Regis Hotel gave us a very memorable experience. In all aspects of service and customer focus, the staff were fantastic! We would recommend the hotel to anyone looking for a top quality service experience.